The biggest problem with success is replicating it. The blood, sweat and tears that are shed in the process of reaching greatness always takes a drastically larger toll than any champion is willing to admit, and so they’re almost always at the root of the failure to retain their crown. chelsea's changing of the guard has been anything but a smooth transition. In professional soccer, this saying rings particularly true. Success usually means winning the league or advancing to the late stages of drawn-out knock-out competition(s), both of which require a tremendous amount of energy, focus and planning. For instance last season, Barcelona’s two-trophy haul was the product of a 60 match season, and their pint-sized prince Leo Messi played in 55 of those matches. I don’t care how fit you are, nobody can play that many games in 12 months and be fresh for most of the following season. The prolonged stress on both body and mind normally don’t manifest themselves until the following season, when all of the energy from last season finally catches up with them. It’s for this reason that we have yet to see a club repeat as Champions League winners, and even more rare that we end up seeing teams that are truly dynasties. Hell, for some teams, just coming close to sustained excellence ends up consuming them. Just look at Chelsea. Despite pulling in an impressive three League and FA Cup titles each in the last six years, their billionaire owner, Roman Abramovich, has eyes for only one prize: the UEFA Champions League. His vast amount of oily riches has propelled the Blues agonizingly close to his goal on several occasions, but they’ve not been able to clear those last hurdles. And in pursuit of Champions League glory, Abramovich’s actions and itchy trigger finger has left Chelsea teetering precariously in the balance. In the nine years since the Russian oligarch bought the club from Ken Bates, Abramovich has burned through 6.5 managers (I’m only counting Hiddink as half, since he was technically just an interim manager), some of which were the finest and most successful in the game over the last decade. His tendency to poison relationships with his managers, most notably when the fallout pushed José Mourinho out the door in 2007, has undoubtedly undermined their efforts to be crowned kings of Europe. 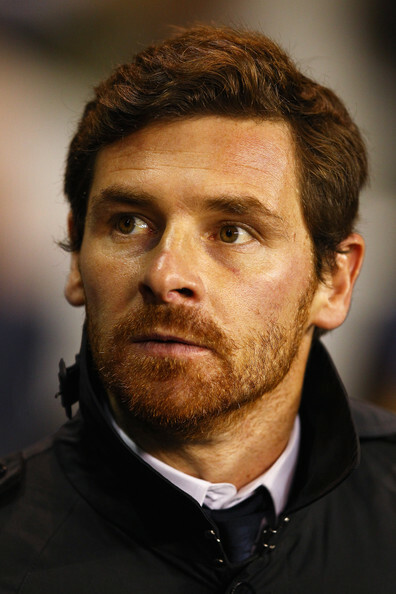 just because AVB doesn't have any grey speckled in his ginger beard (yet) doesn't mean that he isn't a quality manager. That’s why it’s surprising that when Roman decided to dispatch of Carlo Ancelotti this summer — just a season removed from the Italian leading Chelsea to their first Double in club history — and replaced him with a very young André Villas-Boas, I was still caught off guard by the decision. Abramovich’s track record with major purchases acquisitions up until last January have almost always had one thing in common: they all had proven track records. Whether it was a player or manager that was being brought to Stanford Bridge, they were already successful in their prior endeavors. Makélélé, Drogba, Schevchenko, Ballack and Deco were brought in after successful careers abroad. Ca$hley was bribed to swap North London for West London after proving himself, and Anelka had literally played decently for everyone. Likewise, Scolari had won a World Cup, Ancelotti had won two Champions Leagues as a manager and one as a player, and Hiddink has to be some sort of wizard to have pulled off all of the successes he’s had. But Villas-Boas on the other hand, doesn’t have near the same pedigree. Strike one was always going to be that he never played professionally. Sure, the rosy-cheeked AVB hauled in an impressive two trophies last year in his lone season at the helm of Porto. But prior to that, his only experience as the manager of any professional football team was a surprising 9-month spell with Portuguese minnows Académica de Coimbra. Coupled with his young age, his inexperience in the upper echelons of the game was a stark departure from any of the previous new faces that had been brought in by Chelski. So while replacing a relatively (by Chelsea definition) successful manager is hard enough at a big club, Villas-Boas was even more under the gun due to these supposed handicaps. Unfortunately, Chelsea’s form so far this season seems to be giving weight all of those fears. And predictably, AVB has been taking the heat for poor results. And though I love seeing Chelsea in turmoil from a Tottenham fan’s perspective, I don’t think Villas-Boas deserves to be shouldering all of the blame. One of the biggest issues that most of the punditry thought would undermine Villas-Boas’ legitimacy in the Stamford Bridge dressing room would be his age relative to that of many of the big, influential players at Chelsea. At 36, he’s only three years older than Lampard and Drogba, and a relatively five years older than Terry and Cole. With each of those players casting long shadows of influence at the club (Terry in particular) due to their contributions the last few years, there was always a fear that they would have a hard time taking orders from a man that’s a) never played a minute professionally (though this wasn’t a problem for Mourinho), and b) was significantly younger than anyone else they had ever taken orders from. It is this power struggle, in my questionably expert opinion, that is the root of the problems at Chelsea. If André Villas-Boas is ever to have any hope of righting the ship and getting Chelsea back to competing for every trophy under the sun, those star names have to go. And while I’m hardly the first to promote that idea, I think it’s important to examine just why their leaving is so crucial for Chelsea to get back on track..
First and foremost, don’t take my statement above as any sort of slandering of the quality of any of those players. All are still more than capable of playing Premiership football, and I have no doubt that many top teams would love to have them in their sides. However, it is clear that they’re all in the autumn of their careers (though some more so than others). Normally, a squad full of experienced players would be considered a great asset. But with AVB being brought in by Abramovich to reshape the squad and it’s playing style, these older players tend to become a liability. Remember that one of the main points of beef that Abramovich tends to have with his managers is the style of play they force the team to play. The oil baron yearns for attractive, attacking football similar to that found in Madrid and Barcelona, and heads have rolled when they’ve failed to deliver. …which leaves loads of space behind them for your team to quickly counter into and score. That your team apply quick pressure high up the pitch, which forces the opposition to cough up the ball earlier and closer to their own goal. This high pressure requires fit, quick players to apply it appropriately. continuing to lean on the fading elder blues will only hamper the club's future prospects. And the player who highlights this the most is everyone’s favorite punching bag, John Terry. There’s no disputing that Terry was one of the finest center halves of the last decade. His on-pitch leadership abilities, smart distribution, heart, work rate and ability to provide timely runs forward made him a linchpin in Chelsea’s dominance at the turn of the century. But the last two years have been rough on John. His always short temper has gotten shorter, his laziness has increased, and most noticeably, he’s lost some of his pace, too. 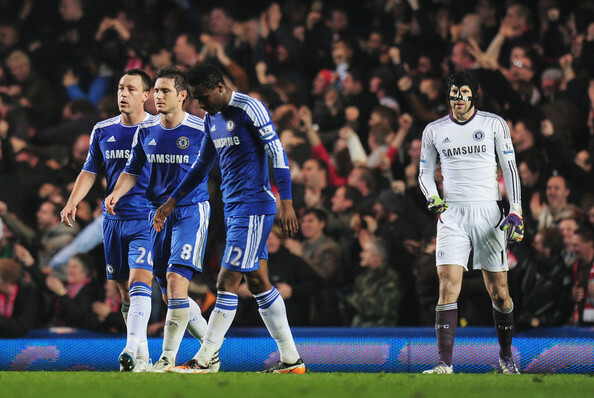 Trouble is, both Terry and Luiz are the type of central defender that likes to push forward and launch the attack. With both of them pushing forward and leaving the middle empty, it’s left AVB’s high defensive line extremely vulnerable to the counter attack goals that have plagued them all season. So to help stem the bleeding, Luiz’s susceptibility to caution/ejection has seen him dropped and Terry instead partnered with the more “conservative” Ivanović. While Luiz’s sacrifice has proven to be marginally more successful as far as immediate results are concerned, it comes off as counterproductive to Villas-Boas’ long-term goal of building an attractive, competitive squad for the future. With a £21 million price tag hanging around his 24-year-old neck, it’s clear Luiz needs to be a cornerstone of that project. Are the short-term results worth sacrificing the development of the “new” Chelsea squad that the manager is trying to build? 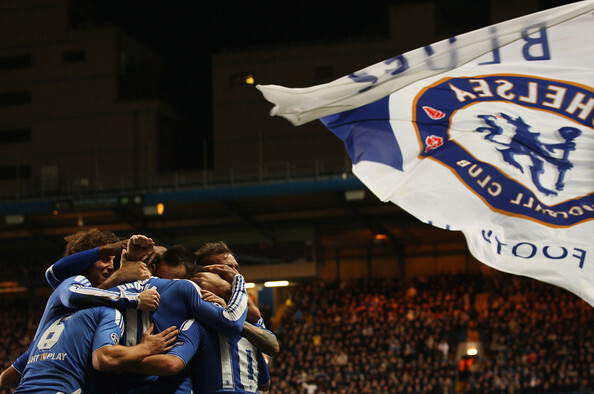 chelsea should rely on their young stars now instead of shelving them for short-term success. Loads of money has been spent to bring in fresh blood in order to remake the squad, but they need to be playing together as much as possible to build cohesion and gel. Daniel Sturridge (£7 million), Raul Meireles (£12m), Ramires (£17m), Luiz, Juan Mata (£23m) and Fernando Torres (£50m) are all great players that need to grow together as a team, and that can only happen if they can get enough games together. Continuing to rely on Terry and Drogba instead of Luiz and Torres — no more than a temporary band-aid — will just harm their confidence and undermine the goal of creating a team for the future. Of course, none of this has taken into account the sway that Chelsea’s veteran players still have at the club. The influence that players like Terry still have over their fellow teammates and club management is palpable, and has led to scores of rumors of a divided dressing room at Stamford Bridge. Whether Villas-Boas has more sway at this point remains debatable, and whether he or the elder statesmen of the team leaves first will likely answer that question. Look, I’m not saying that Villas-Boas is doing a fantastic job and deserves absolute absolution from any of Chelsea’s poor form this season. He’s made plenty of mistakes, for sure, and that’s probably partly due to his age and inexperience and partly due to the normal adjustment time needed to adapt to life in the Premier League. That said, André has also shown a lot of promise, too. And it’s through that promise that I believe he had to have been smart enough to know that this was the type of season he was facing if he decided to fill the vacant hot seat on Chelsea’s bench this summer. One would also hope that he communicated that to Abramovich when he took the job, buying himself a season or two to transition the club from the current aging squad to a young, competitive squad for the future. The trouble with transitions — at Roman’s Chelsea anyway — is that they’re expected to be seamless and just as successful as the periods they’re attempting to bridge. His track record of quickly pulling the trigger has blown some of the time with this golden generation, and firing AVB now could set the next generation off-track before it even get’s its feet wet.